Our experience with feeding solid foods has been very different from Nolan to Theo. Nolan had no real interest in trying to get to our food before we started introducing solids at 6 months, but once we did, he was an awesome little eater who seemed to like everything I fed him–all the same foods we were eating but chopped or mashed up. The texture was never an issue, and once I got some food in his mouth, he never spit it out. (This is mostly the case even to this day, although now just getting it in is the big problem.) 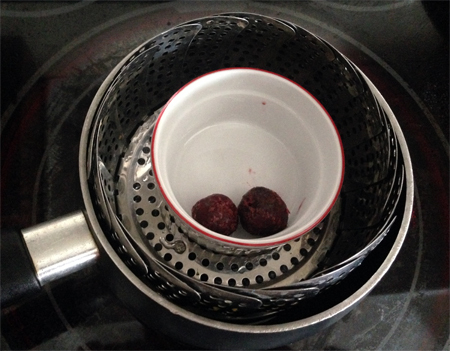 He never seemed to have digestive issues with foods–no matter what we fed him, he had regular bowel movements, never spit up, and showed no perceptible sensitivities. He started getting teeth at 5 months, so by the time he was Theo’s age, he had at least 6 teeth; teething never seemed to affect him at all until we got to the 2-year molars. Theo is 9 months old and has been eating solids for about three months now, but he started trying to steal food off our plates when he was 4 months old. I held off on solids until 6 months because I wanted to make sure his physiological development had caught up to his mental and social readiness. Since birth, he has a much slower-moving digestive system than Nolan did (read: poopy diapers once every day or two instead of every time he nurses), and seems to be more sensitive to certain foods than Nolan was, proteins in particular. For instance, he does well with chicken, duck, and wild-caught fish, but other meats like liver and braised beef tend to plug him up; at 6 months, even egg yolk made him spit up quite a bit more than usual, sometimes to the extent of emptying his entire stomach contents. He also has some very strong opinions about what he likes and dislikes, both with specific food choices and with textures. For the first month or two, he made the funniest sour faces no matter what we fed him! Now I have the sense that he prefers his foods either perfectly smooth or in large fist-able chunks; he spits out most of the chunky bits in his purees. I think this is because he has a very sensitive gag reflex, and I have been working on it by giving him the opportunity to touch some of the food on his tray while he is eating to help him explore it with multiple senses–I do think this helps. Mostly, though, he loves feeding himself, and will gnaw happily on a chunk of tender roasted chicken, shreds of sweet potato, or slices of fruits and vegetables until he eventually eats them up. He is getting very good at moving foods around with his tongue; only rarely have I had to dig a chunk out of his mouth, but of course I am always sitting right next to him for safety whenever he is eating. Theo is still toothless, although right now he is working hard on changing that! He seems to be much more sensitive to teething than Nolan was, with lots of drooling, fussing, nursing, ear pulling, and tongue action; I think gnawing and sucking on chunks of food helps alleviate the pain somewhat. One of my pet peeves with baby food is that so many people use the microwave to heat it up! Microwaving is not only detrimental to the texture and nutrient content of foods, the use of plastic containers or clingfilm can leach carcinogenic compounds into the food, and it exposes you and your food to radiation and EMFs. Why would you buy your baby high-quality organic foods, only to expose them to such detrimental processes? 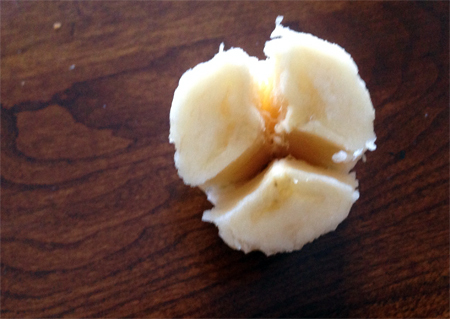 Another quick baby food tip: Did you know that bananas naturally divide into 3 sections if you squeeze them gently? 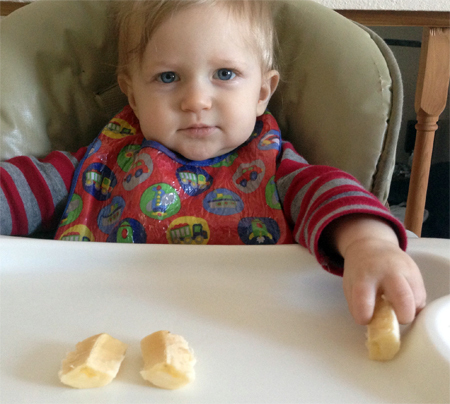 I like to make banana chunks for Theo this way because cut banana is so slimy and hard to grip–this method provides perfectly shaped, non-slimy portions of banana for tiny fingers. I want to share one last parenting “hack” that only relates to food tangentially–namely that Nolan doesn’t eat enough and is as tall and skinny as a beanpole. Ever since he was a baby, we have been struggling to find him pants that will stay up without looking like flood pants. 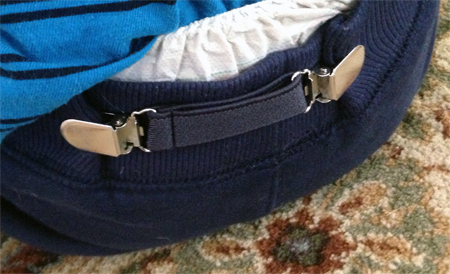 Belt loops or those internal elastic adjusters have been a must ever since he outgrew cloth diapers at age 3, which had helped somewhat by padding his bum with something non-slippery. We like letting him wear soft sweatpants on the weekend, though, and they don’t seem to make those with real drawstrings anymore, so I have always had to chase Nolan around and pull up his pants–until now. 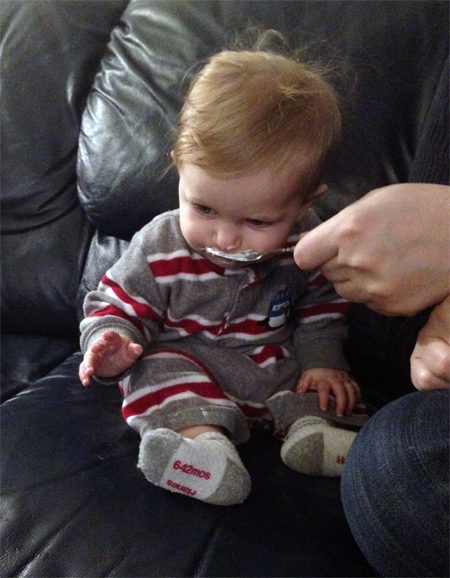 We got some mitten clips to get ready for winter weather this fall, and I realized that we could use them to nip in Nolan’s waistbands! They work perfectly, and are an easy fix for soft-banded pants.